Manchester United extended their unbeaten streak under Ole Gunnar Solskjaer to 10 matches by beating the Foxes at the King Power Stadium. They beat Leicester 1-0 in a scrappy affair with Marcus Rashford scoring the only goal. This win took Manchester United up to the fifth position, just two points behind Chelsea in the fourth spot. Solskjaer named a much-changed starting XI from their last Premier League game as Ander Herrera, Alexis Sanchez and Jesse Lingard all came in. Solskjaer lined United up in a much familiar 4-3-3 with Rashford playing as a centre forward, Sanchez on the left, Lingard on the right and Paul Pogba as a number 10. In the first half, Manchester United started brightly and they took the lead through Rashford after he was put through by Pogba with a beautifully weighted pass. The rest of the first half was scrappy and both teams had chances to score goals but the half ended with United hanging on their lead. In the second half, Leicester started brightly and had much of the ball. But they weren't able to find that final pass. Most of the shots were straight at David De Gea. Manchester United had a couple of counter-attacking chances which they didn't take. In the end, United were able to hold on their lead to make it nine wins out of 10 games under Solskjaer. De Gea had to make regulation saves very often in the match and his positioning could be commended. His highlights were the save of a Rachid Ghezzal free-kick and his save off a Jamie Vardy over-head kick. In the end, De Gea was able keep a clean sheet. Shaw didn't have a good game today but looked solid. He was looking tired throughout the match and lost the ball many times. He didn't offer much support going forward barring a cross or two. Shaw's performances have dipped recently and he needs to get back to his good form back. Eric was brilliant at the centre back position after he replaced Phil Jones from the last game. His interceptions were very timely and his positioning was brilliant as well. Bailly was always up to putting his body on the line to block shots. Lindelof, just like his partner, was very solid and hardly made a mistake with the ball. He never really let Vardy off the hook and tracked him throughout the match. Lindelof has started to show some consistency in his performances and has been United's best defender for at least 10 matches now. Young had a terrible game as Harvey Barnes gave him a run for his money. He lost the ball many times and his crosses, just like against Burnley, were very bad. The Manchester United captain has to improve his performances or else Diogo Dalot will take his place in the starting XI. Nemanja started the match a bit tentatively and he gave the ball away many times. He was over-run by Mendy on many occasions but was helped with the presence of Ander Herrera. Matic was living on the line after picking a yellow card very early in the match. Paul started the match very well after he picked out Rashford with an absolutely sublime pass. After United's first goal, Paul became a bit sloppy as he gave away a few bad passes. He was looking a bit tired in the end of the match but he had enough in him to take United to victory. Ander, as always, brought energy and tenacity with him after he replaced Andreas Pereira in the starting XI. His calmness on the ball and pressing off the ball are integral to Ole's system. Though he gave away the ball a few times in the second half his presence helped United at the King Power. Lingard was largely anonymous in the game but his pressing and tireless work off the ball are what Solskjaer would be happy with. His first touch is what let him down on many occasions and his final pass was just missing. He was later replaced by Phil Jones at the end of the game. 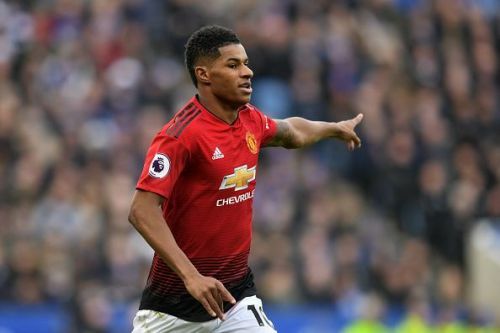 Rashford missed a glorious opportunity in the starting minutes of the game as he mistimed a header very close from the goal, but he made up for that miss. He took his goal very well after he was found by Pogba's delicious pass. He brought the ball down and thumped it into the back of the net. He was later substituted for Romelu Lukaku in the end. Alexis, just like Lingard, was anonymous for most of the match. He did press very well and some of his passes were very good. He lost the ball on many occasions though and that is a problem that Solskjaer would be worried about. Alexis so far hasn't looked convincing under Solskjaer and he was later substituted for Anthony Martial. Martial came on for Alexis for the last 20 minutes of the game and he injected the much-needed pace to the United attacks. He found himself in many promising counter-attacking positions but he just couldn't find that telling final touch. Lukaku came on for Rashford and he didn't have much time to make an impact. Jones came on for Lingard and he didn't have much time to make an impact.